1955 was a pivotal year in the search for Zarahemla. This is a timeline of selected events leading up to that year. 1842 The official periodical of the Church, Times and Seasons, speculated on Book of Mormon connections with Maya ruins visited by Stephens and Catherwood and illustrated in their famous 2 volume Incidents of Travel in Central America, Chiapas, and Yucatan. The sites of Quirigua and Palenque received prominent attention, with Quirigua mentioned as a possible Zarahemla. 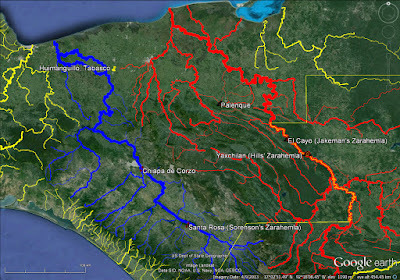 In the ensuing years, the suggested Quirigua/Zarahemla correlation was not pursued because Quirigua is on the south bank of the Motagua which flows eastward. Book of Mormon students even in the nineteenth century realized that Zarahemla would be found on the west bank of a north-flowing river. 1879 George Martin Ottinger speculated in the Juvenile Instructor that Palenque might be Zarahemla. That idea has never faded. V. Garth Norman today believes Zarahemla was in the general vicinity of Palenque. See Juvenile Instructor Vol. 14 No. 5, March 1, 1879, p. 58. 1917 Louis Edward Hills in his A short work on the geography of Mexico and Central America, from 2234 B.C. to 421 A.D. correlated Zarahemla with Yaxchilan. That correlation has remained remarkably consistent among RLDS (currently Community of Christ and Restoration Branch) students of the Book of Mormon from that day to the present. Aric Turner, for instance, in his well-researched contemporary map, correlates Zarahemla with Yaxchilan. 1946 Max Wells Jakeman joined the BYU faculty and began teaching an Usumacinta/Sidon correlation. He was ambivalent about the actual location of Zarahemla. Some tension existed between Jakeman and his former classmate from U.C. Berkeley, Thomas Stuart Ferguson. 1949 John L. Sorenson enrolled at BYU and was quickly recognized as an unusually gifted student. Sorenson was generally unimpressed with Jakeman's scholarship. Jakeman's was more of an historical approach, relying on documentary sources. Sorenson was more persuaded by the rapidly evolving science of dirt archaeology. 1952 Thomas Stuart Ferguson raised money from J. Willard Marriott and Rose Marie Reid and organized the New World Archaeological Foundation in California. 1953 NWAF sponsored its first field season in Mexico. Participants included Pedro Armillas, director, Roman Piña Chan, William T. Sanders, Gareth W. Lowe, and John L. Sorenson. The excavation area - Huimanguillo, Tabasco, was strategically chosen. Ferguson was hoping for a big win and he took his best shot in the lowland coastal plain on the west bank of the mighty north-flowing Grijalva. This was the first time the Grijalva had been seriously considered as a candidate for Sidon. It was chosen partly based on anti-Jakeman bias. 1953 After several months of reconnaissance, surface scavenging, and digging, the NWAF team had little to show. They were looking for pre-classic remains - structures and artifacts dating to Book of Mormon times. What they found was classic material too late to have been relevant to the Nephite record. Toward the end of the field season, they began investigating sites NW of Huimanguillo, closer to La Venta. There, predictably, they did find pre-classic remains. What the 1953 team did not know is that the Grijalva River has changed course since early Nephite times. Tabascan hydrologists have since confirmed that at the time La Venta was flourishing, the Grijalva flowed where the Blasillo and Tonala flow today - right past the famed Olmec site. The map below shows the Grijalva in blue as it flowed at the time the Mulekites founded Zarahemla. See the article "Wandering River." 1953 During the evenings in the Hotel Flores in Huimanguillo, Sorenson and Lowe (the only Mormons on the NWAF team) held Book of Mormon study sessions. They began to develop an interest in the lightly-explored central depression of Chiapas. About March, Armillas led Sorenson and Lowe on horseback into the Chiapas highlands. Again, they found little of interest. In May, as the rainy season was beginning, Thomas Stuart Ferguson came down to check on his colleagues. Disappointed at not finding a viable candidate for Zarahemla along the lower Grijalva, he and Sorenson flew to Chiapas, took off in a jeep, and went on a whirlwind reconnaissance of the upper river. The most important site they found was pre-classic Chiapa de Corzo, but it could not have been Zarahemla because it was east rather than west of the river. Continuing on with mounting enthusiasm, they found literally dozens of small pre-classic sites along the upper Grijalva. Sorenson returned to BYU in June and gave a cautiously optimistic report. 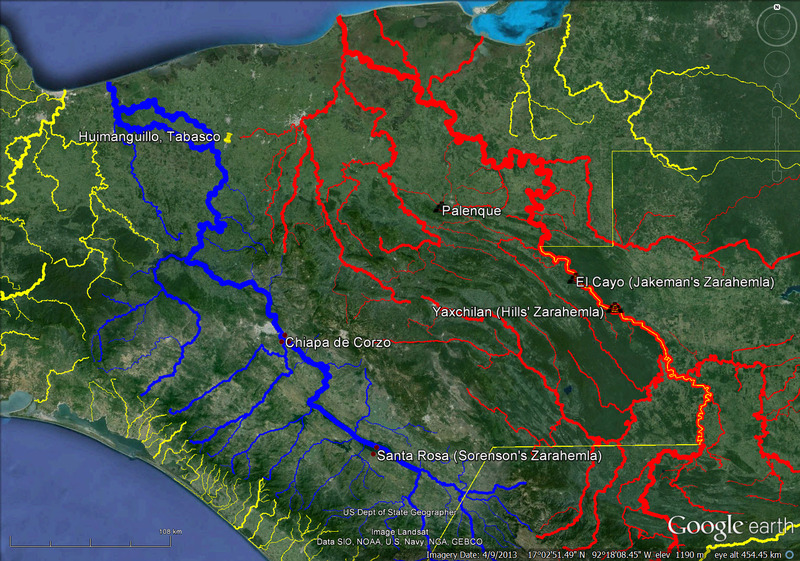 There was a great deal of pre-classic material to work with along the river between Chiapa de Corzo and the Guatemala line. This 1953 adventure was to be John L. Sorenson's only experience as a field archaeologist. He did not return to the area until 1984 when he, Jack Welch, and Joe Allen led the one and only FARMS tour to Mesoamerica. 1954 M. Wells Jakeman, sensing competition, hired an airplane to fly him up and down the Usumacinta River looking for large sites immediately west of the river. El Cayo fit his criteria. Finding chicanel pottery (a pre-classic marker) at the site, he began promoting El Cayo as a viable candidate for Zarahemla. Jakeman's correlation never developed a significant following, partly because travel to the site was so difficult. Bruce Warren, for instance, tried to get to El Cayo overland from the west and eventually gave up without ever reaching the site. 1955 Ferguson secured more money (from the Church which for many years provided up to $500,000 per year), so NWAF returned for a second field season under the direction of Gareth W. Lowe. They began systematic investigation in the central depression of Chiapas. This established a pattern that continued for decades. Lowe did heroic fieldwork. Sorenson did equally important work in the library synthesizing the results of all the data coming up from Chiapas. 1955 John L. Sorenson over the previous two years had worked out the basic details of a Book of Mormon geographic correlation to his satisfaction. Santa Rosa was his Zarahemla, Chiapa de Corzo his Sidom, and Kaminaljuyu his Nephi. The western shoreline of the Gulf of Campeche was his east sea, the Sierra Madre his west wilderness. This model remained little changed through the 1985 publication of his landmark An Ancient American Setting for the Book of Mormon and the 2013 publication of his even more ambitious masterwork Mormon's Codex: An Ancient American Book. This map shows places of interest in the search for Zarahemla. Some takeaways I think are important: A) Given only the text as their guide, the Sorenson/Lowe/Ferguson team in 1952 - 53 went looking for Zarahemla in the lowland coastal plain. The way I read the text, that is precisely where Zarahemla must be. The way he reads the text, John W. (Jack) Welch agrees. He has mentioned more than once in my hearing that Zarahemla has to be in the lowlands. B) Not finding suitable remains in the lowlands west of Huimanguillo, Sorenson and Lowe began considering alternatives. Once he found extensive pre-classic settlement in the highlands on both sides of the upper Grijalva, Sorenson began to re-interpret the text to justify his new model. In other words, he started with some favored sites and then tried to work the text around them. Most serious students would disagree with that site-centric methodology. John E. Clark in his excellent 2011 "Revisiting 'A Key for Evaluating Book of Mormon Geographies' " argues that only a text-centric methodology will prove successful. Late in his career, Sorenson published what he represented as a viable, even definitive, internal model. That is his small 2000 book Mormon's Map. I open Mormon's Map to the first page and immediately note several inconsistencies that contradict my reading of the text. Mormon's Map strikes me as a manipulation of the Nephite record in support of a real world model pre-existing since 1955. C) Largely because of his immense stature as an LDS scholar of the first rank, Sorenson's model has been the de facto standard among Mormon scholars since its formal publication in 1985. It has proven so singularly unpersuasive to rank and file Latter-day Saints, though, that the Book of Mormon geography enterprise is more fragmented in 2017 that at any time since 1830. Passionate devotees reject the Mesoamerican hypothesis and promote unlikely models in the Andes, NW Colombia, Costa Rica, Nicaragua, Baja California, the Mississippi and Ohio River basins, and New York/Ontario. "The facts are that in 1953 (probably in March), I and Gareth Lowe, a fellow BYU student, were led by Pedro Armillas, a noted Spanish archaeologist [and a (wounded) veteran on the losing, non-Fascist side in the Spanish Civil War of the late 1930s], on an archaeological reconnaissance from Huimanguillo, Tabasco, Mexico, up into the mountains of nearby Chiapas state, looking for unreported sites. We had worked at several sites of modest significance in the lowlands during this first season of work by the New World Archaeological Foundation (funded by private Mormon money - mainly from the Marriotts). The NWAF had hired Armillas as field director. We didn't expect to find anything archaeologically important on our trip and in fact we did not. But we saw a number of small rural villages and an awful lot of trees! I have nothing good to say about the horseback riding except that it eventually got over with. Failure to find promising results in the lowland state of Tabasco led to my making a last minute trip up into the Central Depression (basin) of Chiapas, until then unexplored by archaeologists, with Calif. lawyer Tom Ferguson, the dynamo of the Foundation, where we found over a hundred sites, some extremely important, within a ten day period. The Foundation worked for the next 50 years excavating many of those, eventually under the leadership of my buddy, Gareth, who become one of the most respected archaeologists in Mexico (without a Ph.D.). Armillas ended up an anthro. professor at U. of Illinois at Urbana. Two other "student archaeologists" on that first year's expedition, Bill Sanders (of Harvard) and Roman Piña Chan, a native Mayan student in Mexico, both became famous archaeologists in that country." - From an email shared publicly by John L. Sorenson's son, Curtis. Pedro Armillas (1914 - 1984) taught at the Instituto Nacional de Antropología e Historia (INAH) in Mexico City. At the time of his death he was on the faculty of the University of Illinois, Chicago. He was honored posthumously with a festschrift volume in 1992 entitled Origen y Desarrollo de la Civilización en el Occidente de México. William T. Sanders (1926 - 2008) and Michael D. Coe were classmates at Harvard. Sanders studied under Armillas at INAH in 1951. He was on the Penn State Anthropology faculty for 34 years and was elected to the National Academy of Sciences in 1985. He was honored with a two volume festschrift in 1996 entitled Arqueología Mesoamericana. Roman Piña Chan (1920 - 2001) was one of the most celebrated anthropologists in Mexico where he was on the faculty at the Instituto Nacional de Antropología e Historia. He was honored posthumously with a festschrift volume in 2015 entitled Las Grandes Ciudades Mayas de Campeche. Gareth W. Lowe (1922 - 2004) ran the New World Archaeological Foundation (NWAF) from 1959 to 1987. He was honored posthumously with a festschrift volume in 2007 entitled Archaeology, Art, and Ethnogenesis in Mesoamerican Prehistory. John L. Sorenson is the last man standing of this distinguished quintet. He founded the BYU Anthropology Department. Sorenson was honored with a festschrift volume in 1998 entitled Mormons, Scripture, and the Ancient World. Relatively few scholars have such impactful careers that their colleagues honor them with a festschrift. All five of the inaugural season NWAF team members who dug for Zarahemla in 1953 were so honored. It was an all star team. "In 1952, having just completed an M.A. degree in Archaeology at BYU, I was contacted by Thomas Stuart Ferguson, who had recently founded the New World Archaeological Foundation based in California. He invited me to join the planned first field season of research sponsored by the NWAF in southern Mexico in January. My friend and fellow graduate student Gareth W. Lowe was also invited. We were the only two Mormons to be involved. Despite our very limited personal financial resources, we both agreed when the Foundation agreed to pay $200 per month to "support" our families, minimally, for the six-month period.